Toronto Dogs Directory: When Will Canada Implement Protocols For The Transportation Of Domestic Animals To Ensure Their Health And Safety? When Will Canada Implement Protocols For The Transportation Of Domestic Animals To Ensure Their Health And Safety? In the last year we have seen accidents involving transport vehicles, we’ve seen parvo and ringworm and other worms & germs transported, and undo stress put on animals. Thousands of animals are being moved both within Canada and into Canada, and with this comes the risk of spreading disease, causing stress to the animals and potential accidents waiting to happen. Unlike the US that has state to state requirements for transportation of domestic pets, Canada has NONE! Its up to us to be proactive and aware of all the issues involved. There are many facets to proper transportation protocols from using appropriate crates to disease containment. It is important that all rescue organizations or transport organizations have a list of protocols in place for the transport of domestic pets for their volunteers to follow. Far too often we are seeing parvo, ringworm and other nasty illnesses being transported, multiple species being transported together causing animal stress, crates crammed into vehicles and not properly secured and a multiple of other issues.  You should wear disposable gloves when handling ANY animals during transport, always changing your gloves after each animal.  All pets should be crated or tethered safely. Crates should be disinfected prior to and after each transport and in good condition with no broken parts and secured properly in vehicle, not loosely stacked on one another or “mcgyvered” in. If you do have to stack crates, ensure that there is something to prevent “spillage” from the crates on top and that they are properly secured so they don’t move around. Animals must be able to stand up and turn around in the crate.  Do not risk having dogs loose while driving. If you are transporting more than one tethered, ensure they are safely kept away from one another a) to ensure you are not spreading potential illness and b) to prevent a possible dog to dog issue.  No animals should be riding shotgun and that includes on someone’s lap, unless in a small crate that is properly secured in place.  If dogs/cats are crated, cover each crate with a sheet/blanket etc to prevent the disbursement of feces or urine or other bodily fluids. Using cardboard in between crates is also recommended.  Each animal should have its own leash and not be switched between multiple animals. The leash should remain with the animal from beginning to end of transport. If leash is to be used again for another transport, it needs disinfected i.e. bleach/water. 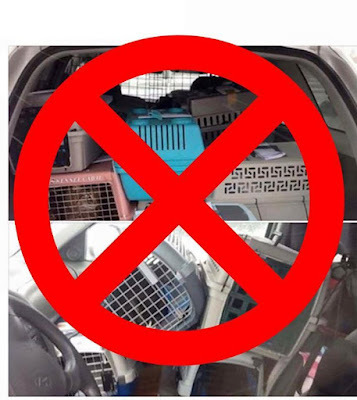  Transporting of multiple species is not recommended due to the undo stress that can be created for the animals. Also, transporting of animals from multiple shelters/facilities is also not recommended for health reasons.  If you have to stop and potty animals, ensure you clean up the ground thoroughly, after a bowel movement in particular. Bring a spray bottle of bleach/water solution and spray the ground where the dog went, especially if the meeting places are the same all the time and in public areas.  Water should be provided every 4 hours en route  Most animals being transported have little to no vetting and likely have not been quarantined for any period of time. It is important to remember this especially if you have personal pets at home that could be affected.  If animals have been vetted, ensure that ALL paperwork is travelling with pet in envelope and marked with name of pet  Wear old clothes. Clothes that you can easily toss away if necessary. Wipe the bottom of your footwear with bleach once transport is complete. Also, change clothes immediately and wash with bleach before interacting with personal pets. Do NOT visit any public stores/areas until completion of transport and clothes and footwear have been changed with the exception of change of leg on transport and bathroom area.  ALL animals should be provided a de-stress period at the end of transport and NOT unloaded at an event at a public place.  ALL animals should be inspected visibly prior to being loaded for transport, checking for any signs of illness or injury, that includes, sneezing, coughing, runny eyes/nose, limping, lethargy, etc. If any animal shows signs of illness or injury, it should NOT be transported. If an animal shows signs of illness or injury during transport, the animal should be removed from that transport immediately and an alternative found. Also, never transport unquarantined animals with ones that already have been, it defeats the entire purpose of quarantine.  ANY unweaned kittens / pups must be transported with mama in same crate.  ANY unvaccinated/unweaned puppies should not have “paws on the ground” during transport  DO NOT bring personal pets or children with you on transport! The hope is, that anyone that volunteers to transport animals or runs transports for animals, considers the importance of this information and not only the health and well being of the passengers but that of the drivers and their vehicles as well. ***The above information reprinted with permission from Air Angels Canada. of Canada's pets. Regulations are long past due. This is a disaster waiting to happen. God forbid there was an accident, never mind the amount of worms and germs that are likely being shared.